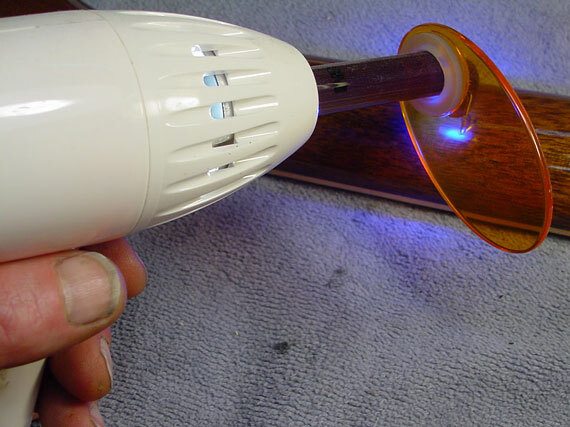 This is my favorite use for the dental light cure system that makes quick work of nut filling. Dan Erlewine got me started with this setup about six months ago, and it's now a serious tool in my shop. 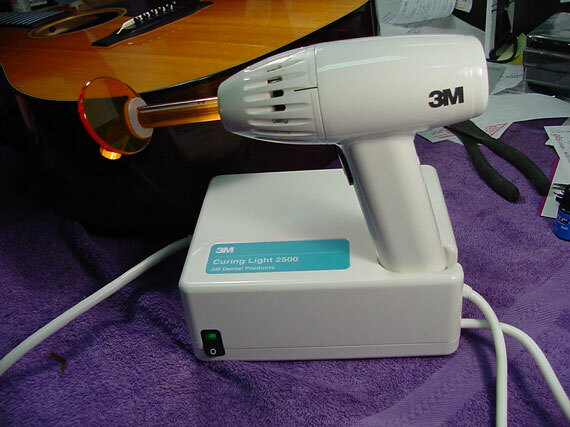 My curing light is the 3M model 2500, which is a 75 watt high intensity light with a specific filter and a fiber optic nose piece to direct it. 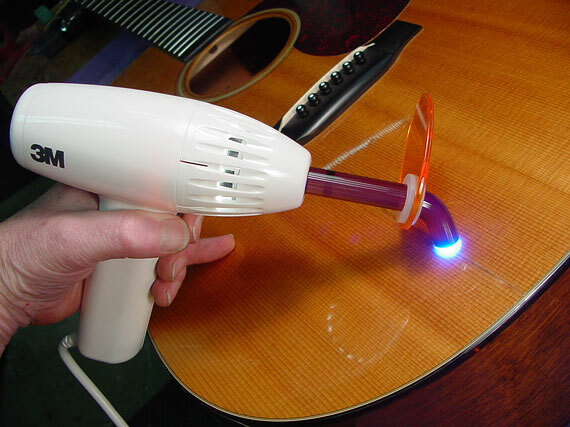 It's basically the same technology as the UV cure finish that's used in the guitar finishing industry, but this dental system works in the visible range. If you're interested in getting one of these rigs, you'll find them easily with a simple Internet search. A typical top ding in a catalyzed finish that shows a lot of broken facets and lines where it shattered. Because I have no solvent to amalgamate or melt the finish, I must be content with simply filling the area the best that I can. 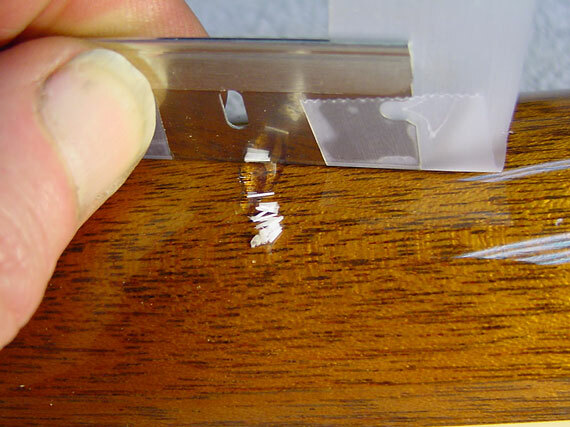 In this case, I picked out all the broken pieces to reduce the reflective effect of all those crack lines. 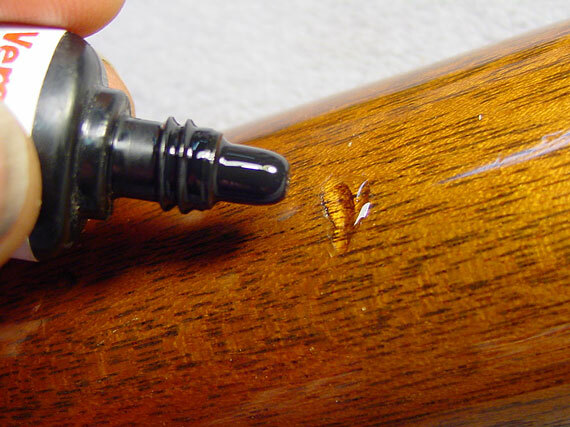 After steaming the dent to raise it a bit, I dabbed on just a tiny bit of very dilute hide glue, which tends to keep the fill material from penetrating and darkening the light wood. 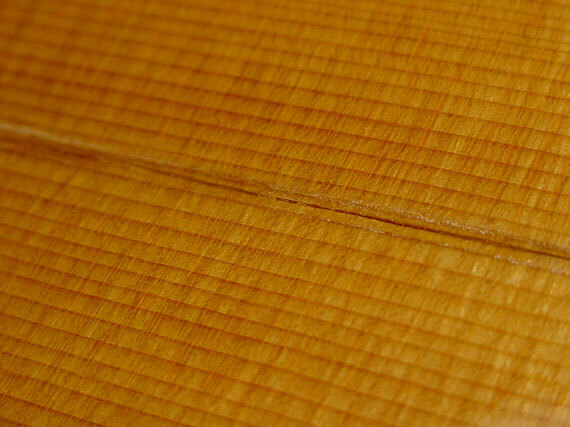 This is more often a serious problem with cedar. 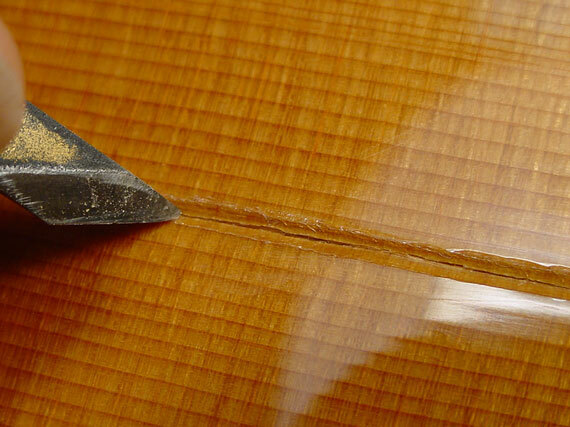 With all the broken and crushed fibers, even a clear fill tends to look very dark. 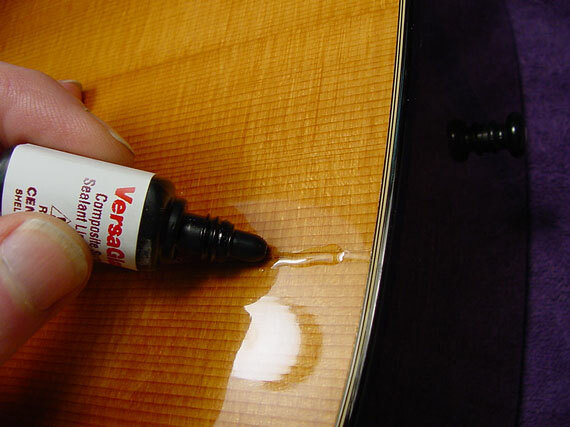 Next, an application of "Versa Glaze," a clear finish that dentists use on teeth sometimes. And a blast of that infamous light. 20 seconds was enough to cure the fill thoroughly. A bit of razor blade scraping to level the fill almost to the surface. 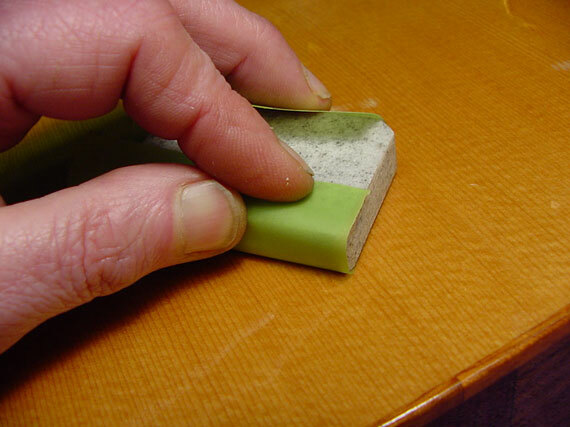 I leveled the finish by sanding with 1200 grit waterproof paper, followed by Micro Mesh 2400. After buffing, the ding shows clearly because it was so deep, but the surface is flat, level and just as shiny as the surrounding original finish. Here's the same job on the back of a neck. In goes the Versa Glaze. Here's a quick view with the yellow ("Blue-Blocker") shade moved aside. Don't look at this for long, it's mighty intense and can cause retinal damage. One more job. 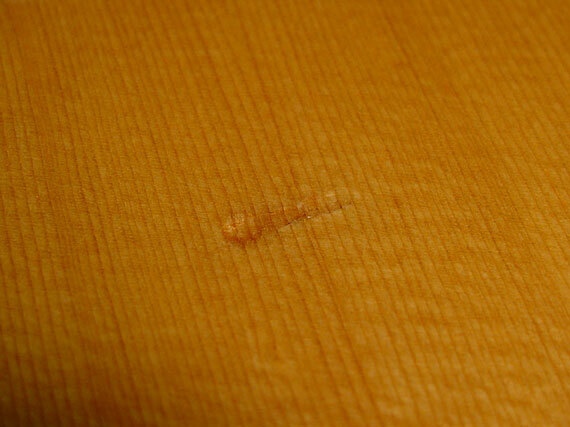 This one is a nasty top gouge that's so deep it looks like a crack. It doesn't actually open, but there's a tiny line down inside that looks like the start of a crack. 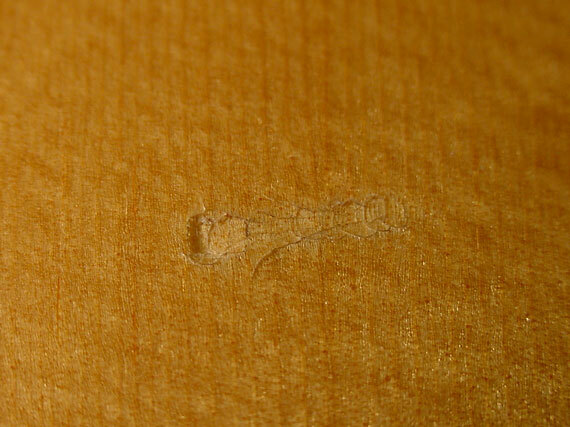 The first part of this repair was to use a bit of clear dental adhesive. 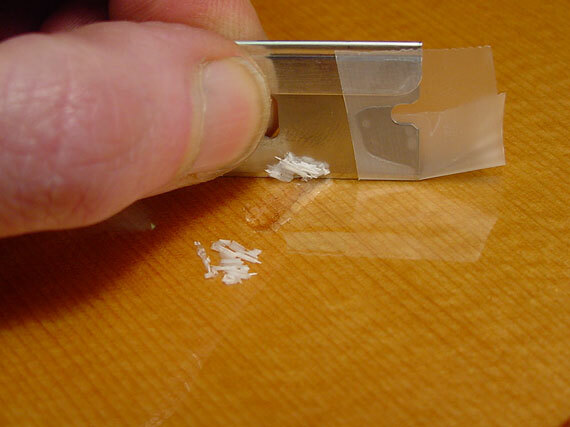 It's just about as runny as thin cyanoacrylate, so it penetrates cracks in teeth, I suppose. 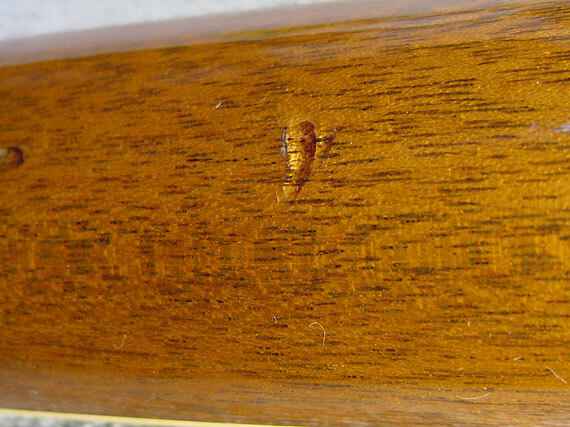 Here it drains right down into the wood through the broken finish. I had to move the light along the crack slowly because it has a narrow focus. 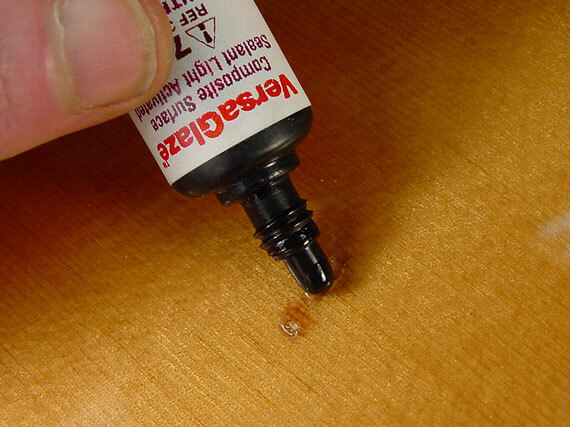 It took about a minute to cure the glue. 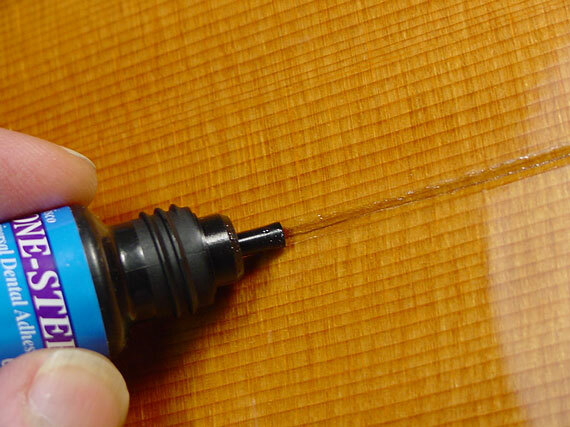 Next, I roughed up the finish that lined the sides of the groove to allow good adhesion for my fill, and to pick out any reflective bits of finish. 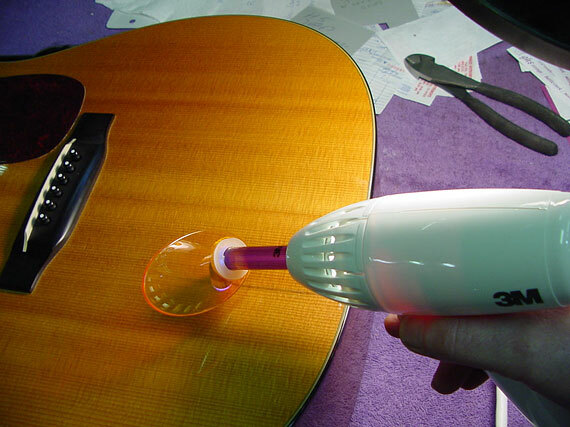 This guitar has a catalyzed finish, so I had no possibility of melting it. 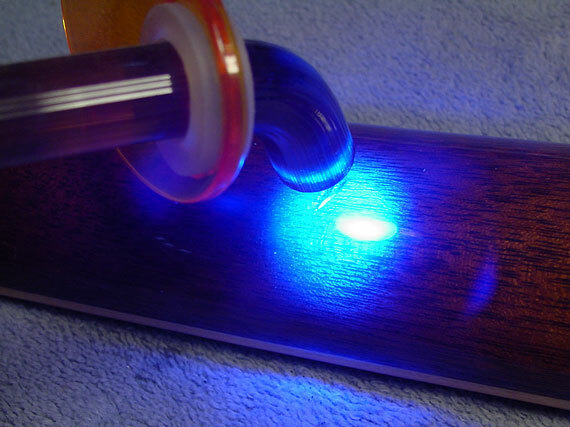 A bit of the clear Versa Glaze. And, waving the magic wand, I turn the liquid to solid. The fill material seems to be about the same hardness as the original catalyzed finish. Done. If you look really closely, you can see a tiny margin at the top of the finish fill. 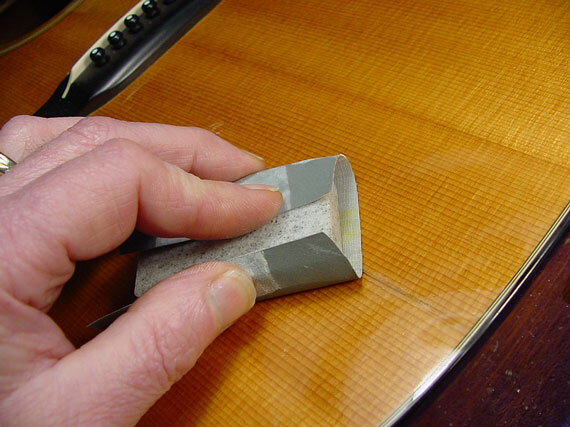 That's typical of catalyzed finish filling because the new and old finishes don't actually melt together as lacquer would. Nonetheless, it's a good clean look with the same reflective surface as the surrounding original finish. And, being a catalyzed polymer, the new fill won't shrink, even though it was applied only minutes before polishing.